BOGOR, Indonesia (20 June, 2011)_The Indonesian president’s office has stated that the moratorium on new forest concessions, announced last month, will protect 64 million hectares of forest across the country. What is included in those 64 million hectares? Is this level of protection feasible under the terms of the moratorium? BOGOR, Indonesia (20 June, 2011)_The Indonesian president’s office has stated that the moratorium on new forest concessions, announced last month, will protect 64 million hectares of forest across the country . What is included in those 64 million hectares? Is this level of protection feasible under the terms of the moratorium? The following analysis takes a look at the numbers. It is based on published data and reports  in the absence of official geospatial data. Primary forest and protected areas: what is a net gain under the moratorium? According to the Ministry of Forestry (MoF), there were 44 million hectares (44 M ha) of primary forest in state forest lands (Kawasan Hutan, KH) in 2006, the last year for which MoF data are publicly available. That number exceeds the 37-38 M ha of forested land that was already protected under previous law by at least 6 M ha. The total area under protected forest status (Hutan Lingdung (HL) + Hutan Konservasi (HK)) was 48-50 M. Although it is possible that the additional 10-13 M ha of legally protected land in non-forest and shrub might be restored or allowed to recover, that would not readily be construed as ‘protection’ of primary forest and peat land. Over 6 M ha was non-forest in 2006, suggesting that it had truly been converted to other uses. Thus, protected lands alone are not enough to get to 44 M ha, much less to 64 M ha. Assuming that the 37-38 M ha of legally protected forestland that was forest in 2006 was in fact primary forest, at least 6 M ha of primary forest must have been outside these protected areas. They must have been in the production forest. If these areas are not currently under existing licenses, and have not been approved by MoF ‘in principal’, this would be a minimum net gain of 6 M ha from the moratorium. Alternatively, some of the 37-38 M ha of legally protected forest land that was forest in 2006 may not have been primary forest. If 10% were disturbed (3.8 M ha), the amount of officially recognized primary forest found outside of protected areas (and by default in production forest) would increase from 6 M ha to almost 10 M ha. Gains beyond 6 M ha depend on the extent of disturbance in protected area forests, and whether or not the undisturbed production forests have been officially designated for logging or plantations since 2006. Only 1 million ha of primary forest were in Areal Penggunaan Lain (APL), outside the KH, in 2006. Thus, the total area of primary forest land potentially protected by the moratorium is 45 M ha, if in fact this area still remains primary forest in 2011 (44 M ha in KH, 1 M ha in APL). But the analysis of the president’s office suggests that the moratorium will cover 64 M ha. Where are the remaining 19 M ha? As evident from the indicative map, much of this remaining 19 M ha must be in peatlands. A conservative estimate of total peatland area in Indonesia is 22.5 M ha . So, theoretically, the moratorium could extend protection to the majority of Indonesian peatlands. In 2000, 1.1 M ha of peatlands had already been converted to relatively intensively-managed croplands; these are clearly not protected by the moratorium . Almost 14 M ha of peatlands were still forested in 2000. Should they remain intact in 2011, and should they all be protected by the moratorium, this would represent a significant gain, especially given the high potential emissions from peat deforestation and drainage. 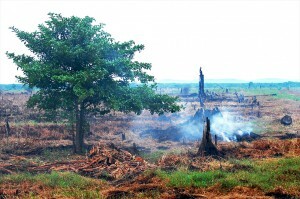 However, in the late 1990’s peatlands were being cleared at a rate of 1.8% per year in Kalimantan and 1.9% in Sumatra. High rates of peat deforestation persisted after 2000. Two independent estimates of clearing since 2000, one based on licensed oil palm concessions between 2000 and 2005, and the other based on extrapolating historic peat deforestation rates, suggest that an additional 1.7 M ha should have been cleared by 2010. Taking the minimum estimate of peat cleared for industrial development between 2000 and 2010 (1.7 M ha) plus the 1.1 M ha already cleared in 2000 yields 2.8 M ha. This is less than the difference between the 22.5 M ha that includes all peatlands and the 19 M ha of land needed to match the assessment of the area affected by the moratorium presented by the president’s office (in addition to 45 M ha of primary forest). Yet, 1.7 M ha of additional peat clearing is the most conservative projection. Considering timber plantations and logging concessions in addition to oil palm indicates that 5.7 M ha  were already slated for development by 2005. If only half of that development came to pass, the result would be almost 4 M ha  of developed peatlands in 2010. From the original 22.5 M ha, this leaves 18.5 M ha, just under the 19 M ha of peatlands needed to arrive at 64 M ha protected under the moratorium. If not half, but all identified concessions were developed between 2000 and 2010, only 15.7 M ha  of peatlands would remain, to be affected by the moratorium. The ‘middle of the road’ projection (half of the 2000-2005 concessions developed) leaves almost 11 M ha of relatively undisturbed, forested peatlands. Their protection under the moratorium would represent a significant gain. What is the status of the remaining 7.5 M ha of peatlands? In 2000 it was occupied by a mix of degraded land, small-scale agriculture, and shifting cultivation in a mosaic with natural vegetation. It seems likely, given the calculations above, that this land is supposed to be protected from further development under the moratorium. Protection, however, is not likely to avoid vast amounts of CO2 emissions for the simple reason that much of the land may already have been drained. Throughout the 7.5 M ha disturbed peat area, the aboveground vegetation had been substantially altered by 2000. More importantly, however, two-thirds of this disturbed area is likely to have been drained to a greater or a lesser degree . That leaves only 2.5 M ha of the disturbed peat area where soil-based CO2 emissions have not already been committed (lost to the atmosphere in the future). Where drainage has occurred in the other 5 M ha, decomposition will result in a steady loss of CO2 from soil regardless of a moratorium on further development. Thus, it appears that the moratorium could prevent the vast majority of emissions from 13.5 M ha of peatlands, or 60% of Indonesia’s total peat area (11 M ha of forested, undisturbed peatlands and 2.5 M ha of moderately disturbed peatlands). For 5 M ha that have been disturbed and partly drained, the moratorium is not sufficient as a tool for avoiding future emissions. In fact, restoration efforts would be needed to avoid emissions that can already be anticipated due to historic drainage. Although these 5 M ha of disturbed (but not industrial) peatlands are not likely to deliver the massive ‘avoided emissions’ hoped for, they are clearly an important element of the moratorium. Without them, it is hard to find 64 M ha of land that, by definition, falls under the moratorium. The only two categories mentioned in the moratorium are primary forest and peat. The upper bound on primary forest is well defined by the 2006 MoF data (45 M ha). As written, ‘peatlands’ can include both primary and secondary forest. This analysis, in light of statements by the president’s office, suggests both were intended to be covered under the moratorium . Because of the extent of legally protected forest that may overlap with forest protected under the moratorium, the net gain from protecting primary forest may be limited. If the protected areas have been and continue to be well protected, the gains in primary forest protection attributable to the moratorium could be no greater than 7 M ha. If, however, protected areas have not been effectively managed, more of the remaining primary forest by default falls into production forest. In production forest, the moratorium would have a significant, positive effect, giving new legal protection to primary forest. The amount of newly protected primary forest could increase to 10 M ha, or even double, to almost 14 M ha , if 10% or 20% of the protected areas were already disturbed in 2006. The moratorium could result in avoiding major emissions on 13.5 M ha of peatlands. For peat forests, prior drainage in large areas designated for protection under the moratorium (perhaps 5 M ha), limits the efficacy of the moratorium. 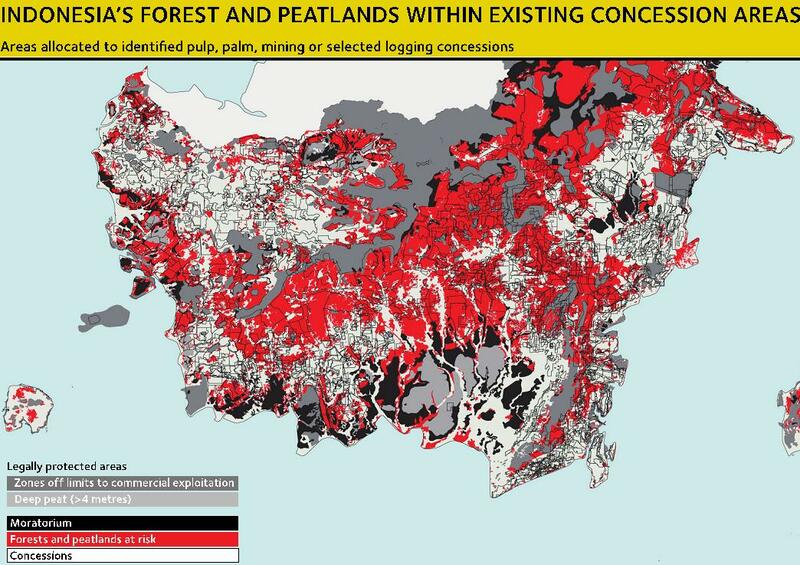 As with primary forest, what the moratorium can actually deliver depends critically on the extent of peatland area for which concession licenses have already been received or agreed to in principal. The contribution of peatlands also depends on the extent to which they are distinct from both protected areas and primary forest. This numerical analysis assumes peatlands are separate and thus represent entirely additional gains under the moratorium. Most likely, this assumption does not hold. Spatially explicit analysis is necessary to determine the extent of overlap among these critical categories of land cover and land use. Many of the assumptions made above are somewhat tenuous, especially the unchanged status of primary forest since 2006, the degree of risk to protected areas and the continuation of historic peat deforestation rates. However, altering some of those assumptions may not radically change the outlook for the effectiveness of the moratorium. The most critical assumption, and the most difficult to accept, is that much of the forest outside of legally protected areas has not had licenses granted or approved in principal. Although the numbers can ‘work’ in theory, it seems likely that true gains could occur on an area in the range of 20-30 M ha rather than on 64 M ha. Exceptions to the moratorium, for existing licenses and approval in principal, make realizing even this potential extremely difficult . The final numbers are likely to be substantially smaller. Spatially explicit analysis of the indicative map, land cover, and concession boundaries is necessary to better understand the potential gains under the moratorium. Such analysis is urgent. Without it, the informed dialogue about long-term solutions, for which the moratorium created space, is impossible. Wetlands International maps, cited in A. Hooijer, S. Page, J. G. Canadell, M. Silvius, J. Kwadijk, H. Wosten, and J. Jauhiainen. 2010. Current and future CO2 emissions from drained peatlands in Southeast Asia. Biogeosciences 7: 1505–1514. Hooijer et al. 2010 (see footnote 3) is the source for most of the peatland data, unless otherwise noted. Hooijer et al, 2006 cited in B. Wicke, R. Sikkema, V. Dornburg, M. Junginger, and A. Faaij. 2008. Drivers of land use change and the role of palm oil production in Indonesia and Malaysia: overview of past developments and future projections. Final Report. Copernicus Institute, Universiteit Utrecht. 4 M ha = 2.9 M ha developed from 2000-2010, 1.1 M ha already developed in 2000. Based on calculations from Hooijer et al. 2010, Table 1. 18.5 M ha comprised of 11 M ha of undisturbed, forested peatlands, 2.5 M ha of moderately disturbed peatlands, and 5 M ha of partially drained, disturbed peatlands. Added to 45 M ha of primary forest, yields almost 64 M ha. If 10% of 37-38 M ha of protected areas were disturbed rather than primary forest, almost 10 M ha of primary forest would have been in production forest in 2006 (6 M + 3.8 M); if 20% were disturbed, 7.6 M M ha would be added to the 6 M ha already found outside of protected areas.